Gold futures changed little again Wednesday — their fourth straight modest move, and marked their third decline in a row. Gold for June delivery shed 70 cents, or 0.05%, to settle at $1,313 an ounce on the Comex division of the New York Mercantile Exchange. 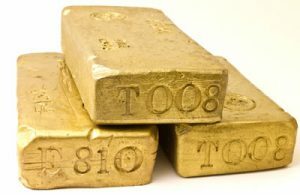 "Gold market bulls are fighting to hold the yellow metal above critical chart support at $1,300.00, and they have been successful so far, which has stabilized the market for the time being," Jim Wyckoff, a senior analyst at Kitco Metals Inc., said in a daily note. "The lack of risk aversion in the marketplace at present is working against the safe-haven gold and silver markets," Wyckoff added. Gold futures ranged from a low of $1,304.20 to a high of $1,317.20. They slipped 40 cents on Tuesday and dipped 60 cents in starting the week on Monday. Silver for July delivery rose 6.7 cents, or 0.4%, to close at $16.539 an ounce. Silver futures traded between $16.37 and $16.57. They lost 0.1% on Tuesday and fell 0.2% on Monday. July platinum added $4.50, or 0.5%, to $916.60 an ounce, ranging from $908.50 to $916. Palladium for June delivery gained $7.20, or 0.8%, to $970.60 an ounce, trading between $961.80 and $969.10. LBMA bullion prices are available on the LBMA website with a delay of midnight. United States Mint bullion sales were unchanged Wednesday after logging their first gains of the month on Tuesday.